Everyone pretty much agrees that the most troubling and challenging aspect of PBL is the actual process of running a project. At our recent Project Learning Swap Meet in Sydney, Mike Wheadon made the insightful point that many teachers know what happens at the beginning (the project launch and the DQ) and the end (the celebration of learning) but many are still fuzzy about what happens in the middle. I nicknamed this the ‘mushy middle’ and it became a repeated metaphor that we returned to throughout the day. Before the Swap Meet, I put together a small booklet of my ‘go to’ resources for managing the mushy middle of project-learning. Even though these are resources that I have created and/or used for many projects, different resources work better with different students. Remember that it’s always about context – just try something with your students and if it doesn’t work, evaluate why and then try again or try something different. I wanted to share those resources with those of you who might similarly be struggling with the question, ‘How does PBL work day-to-day in the classroom?’. I sense that this concern is mostly to do with managing team-work (which is really bloody hard and I certainly don’t have the answer … just ask my students!) and the nature of assessment. There really isn’t one way to approach either of these issues – as I said above, it’s very much about trial and error, taking risks and being confident to discuss the problems with your students. I know this is very hard to do, but it is necessary to embrace the fact that PBL is essentially a messy process where the best thing a teacher can do is step out of the way and let kids work things out for themselves. Letting go can be very stressful for teachers, but nothing can replace the sense of liberation you will experience once you do, I promise. NOTE: These resources are not in any particular order … just in case you read into how I upload them, lol. Goals/Medals/Missions: I’ve written heaps about this in the past. This is a formative assessment strategy developed by Geoff Petty in response to the research of John Hattie and Black and Wiliam. You can google their names and find out cool stuff about assessment if you so choose. I use GMM in three different ways to help support my students’ learning. Firstly, as a daily learning reflection method. Students keep a simple journal in the back of their workbooks where they record their personal goals, medals and missions for that lesson. I don’t use this with all classes, all of the time. Often I forget. I am human. Secondly, I create checklists for the product being produced (poem, performance, speech, essay, story… whatever) with students identifying what must be included. This checklist becomes their self and peer assessment tool and students identify M&Ms at the bottom of the document for the work they assessed. You can download an example here: personal-essay-checklist. Thirdly, at the end of a project, I collect students’ individual project folders and I give them M&Ms for the skills and content I was targeting for that project – e.g. collaboration, presentation, creative thinking, knowing poetic devices, essay structure, narrative techniques etc. Always give more medals than missions – super important tip!! Team contracts: When I first started doing PBL, I thought these were completely naff. I didn’t use them for years. Now, I think they’re really important documents for my students. Signing that piece of paper means you’ve committed to your team. It means that if you fail to do your bit, your team can justifiably by annoyed and there can and will be consequences. You can get a good team contract from the bie.org freebies section. It’s always best if students create their own contract, of course. Project Management Log: This is another BIE document that I ignored for years in my attempt to avoid paper in my classroom. Just recently I’ve discovered the power of a management log whilst working with my Year 9 students. It takes time to fill this document in, but it is really worth the time. Like the team contract, it allocates responsibilites to each team member, but it also helps students to become more independent each lesson as they have direction in their learning. It’s as much about time management as it is about role/responsibility allocation. You can get a copy of the project management log document from the bie.org freebies section. Learning spaces and metalanguage: The best project classroom is going to be a flexible space. I know we don’t all have those rooms with cool bright furniture on wheels, but we all do have access to open spaces like ovals and quadrangles. Make the most of them and get your kids outside when it’s appropriate. A great tip I stole from the peeps at New Tech High is using staircases as presentation spaces – the audience sits on the stairs and the speaker/performer stands at the bottom. This is the type of creative use of existing space necessary for a successful project-learning class. As you know, I think metalanguage is powerful and have adopted the names of spaces used at NBCS, inspired by an essay by Thornburg. You can read about my thoughts on metaphors for learning spaces here. Project packets: The term ‘packet’ for a bundle of worksheets it so American – we just don’t use it here in Australia. When I say ‘packet’, I mean ‘packet’ in the Aussie sense – a bunch of stuff in a container. For me it’s an envelope of documents. Of course it doesn’t have to be an envelope (I bought plastic document wallets for 50c each at Officeworks), it can also be a plastic tray or a plastic sleeve folder. It is one packet of information per team. It contains only the essential documents required for project success: project management log, team contract, project calendar, project outline and supporting documents to guide them through the inquire, create and present cycles of learning. These stay in the classroom in a central space that students can access each lesson. They don’t go home – if they did they’d never return! Project walls: A project wall can be physical (an actual wall space in your classroom), or virtual – online somewhere like a weebly, glogster or blog. It is a space for key project elements to be shared. It’s similar but different to the project packet. It keeps students focused and organised but also showcases the learning that has occurred so far. Essentials for the project wall are: project outline, driving question, student-generated ‘need to know’, project calendar, key project vocabulary and the lounge roster (in-joke, lol!). SOLO Taxonomy: This is just another strategy to help students self-assess and monitor their learning. I’m not a SOLO guru but I know there are heaps of them online, so go find and follow them. Our mate Tait Coles is the gun when it comes to incorporating SOLO into a project-learning-style classroom. I really like SOLO and my students have had great success with it. Their honest self-evaluation can be enlightening and terrifying for teachers. Punk Learner rubric: This is a piece of genius created by the aforementioned Tait Coles. He created this rubric with his students and passionately encourages you to steal the idea of a punk learner rubric, but to create one with your students instead of just using the one him and his students created. It’s all about context and significance. My Year 11 students used this rubric to self-assess post half yearly examinations – as with SOLO, the results are enlightening and terrifying! Team work rubric: Similar to Tait’s Punk Learner rubric, this is about students self and peer assessment to start a conversation and reflection about their contribution to team goals etc. I had a great time creating a team-member rubric with my Year 9 class after some students failed to be effective team-members in the previous project. You can download pre-made rubrics from bie.org freebies page which is a great place to start. Blogging: I think getting your students to start blogging really allows you to follow their individual experience of each project. It’s such a cool way to get into their heads and can be extremely enlightening! 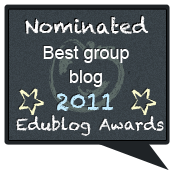 My Year 11 students have successfully used the think/puzzle/explore blogging protocol this year. You can read about that protocol here. Need to Know: This is essentially a list of questions that students decide that they need to have answered. You can use a KWL table for this or just get them to sit in teams and generate a list of five things the definitely need to know in order to be successful with the project. This is a kind of sneaky activity because often you (as the teacher) know what kinds of things they will identify – but that’s what differentiates the typical classroom experience from the PBL experience – it’s about students identifying what they need to know and how they will discover that. I love putting these questions up on the project wall and returning to them each week to monitor learning – students like being able to cross questions off the list and it helps them see that they are learning. Project calendar: I think this really is a PBL staple. It’s so normal and expected in the ‘real world’ (love that phrase cos it makes me laugh, is a school an unreal world? lol!) that we plan our projects, that we look to the future and organise our time in advance because we want to be successful and know that we need to negotiate time, money, space, people etc in order to be successful. I love the BIE project calendar – you can’t beat it. Download it from the bie.org freebies page. Rubrics for products: I wouldn’t say that these are essential. After years of doing this PBL caper, I’m kind of getting suspicious of rubrics. I find them too prescriptive and constrictive. But that’s me coming from a place of much experience with using them in the classroom. I personally think that students don’t like using them and they don’t use them well. A check-list is better. If you are going to use them, create them with your students and make sure they are written in student-friendly language. You can use Rubistar to find pre-made rubrics as a model for what you and your students can create. I used a rubric created with my students for assessing rap-battles earlier this year. You can see it here. Formative assessment strategies: You need HEAPS of these, and really a number of them are in this list anyway. Be creative with your formative assessment – use a variety of online, face-to-face, recorded, team and individual formative assessment strategies to provide your students with feedback on their learning. I wrote a post once asking for people to share their favourite formative assessment strategies – maybe you’d like to add to it? This entry was posted in Inquiry and tagged constructivsim, Inquiry Based Learning, project-based learning. Bookmark the permalink.